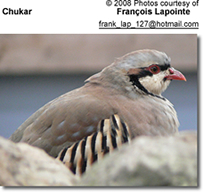 The Grey Partridge, Perdix perdix also known as Hungarian Partridge or Hun breeds on farmland across most of Europe into western Asia, and has been introduced widely into North America and are quite common in some areas of southern Canada and the northern United States. Hens lay up to twenty eggs in a ground nest. The nest is usually in the margin of a cereal field, most commonly Winter wheat. It is a non-migratory terrestrial species, which forms flocks outside the breeding season. It is declining greatly in numbers in areas of intensive cultivation such as Great Britain, due to loss of breeding habitat and food supplies. The numbers have fallen by 85% in the last 25 years. Efforts are being made in Great Britain to halt the decline by creating Conservation headlands. In 1995 it was nominated a Biodiversity Action plan species (see UK BAP). Widespread and common throughout its large range, the Grey Partridge is evaluated as Least Concern on the IUCN Red List of Threatened Species. The Grey Partridge is a rotund bird, 28-32 cm long, brown-backed, with grey underparts, an orange face and a chestnut belly patch. There is little difference between the sexes, although the female has a smaller belly patch. Young Grey Partridges are esentally yellow-brown, and lack the distinctive face and underpart markings. The song is a harse kieerr-ik. When disturbed, like most of the gamebirds, it flies a short distance on rounded wings, often calling rick rick rick as it rises. This is a seed-eating species, but the young in particular take insects as an essential protein supply. During the first 10 days of life, the young can only digest insects. The parents lead their chicks to the edges of cereal fields, where they can forage for insects.